Coenzyme Q10 is a type of antioxidant found throughout the body, and your skin is one of the most abundant sources. Also known as ubiquinone and CoQ10, coenzyme Q10 has been praised for its ability to protect as well as repair the skin. Coenzyme Q10 is available in two forms – oral supplements and topical preparations. While the effect of topical preparations on the skin has been most widely researched, several recent studies suggest that oral supplementation may also prove to be equally beneficial for the skin. Coenzyme Q10 is an antioxidant, which is a type of compound that protects the cells in your body from damage. The level of coenzyme Q10 within the skin rises from childhood to adulthood, peaks at 20 to 30 years of age and then gradually diminishes with age. Within the skin, coenzyme Q10 is localized primarily to the most superficial layer of your skin, known as the stratum corneum, and functions to protect the deeper layers of your skin from damage caused by ultraviolet A light. Exposure to ultraviolet light elicits damage to the skin cells responsible for elasticity. This damage may be manifested as wrinkles, hyperpigmentation, sagging skin or even cancerous lesions. Coenzyme Q10 can be found in the form of oral supplements and topical preparations. According to Italian researchers, the simultaneous utilization of oral coenzyme Q10 supplements and topical preparations may produce higher levels of coenzyme Q10 within the skin than topical preparations alone. The study, published in 2003 in "Biofactors," demonstrated that the simultaneous administration of oral supplements containing coenzyme Q10, vitamin E and selenium along with a topical coenzyme Q10 preparation effectively increases the levels of coenzyme Q10 in the stratum corneum. Application of the topical preparation alone raised the level of coenzyme Q10 in the sebum only, an oily substance produced by the sebaceous glands in your skin. This study suggests that oral coenzyme Q10 supplements may be more effective at increasing the level of coenzyme Q10 in the skin itself than topical preparations. Oral supplementation of coenzyme Q10 may be as effective as topical preparations in reducing wrinkle severity, according to a 2004 study performed by Functional Food Research Labs and H&BC Research Labs. The study, published in "FOOD Style" magazine, found that oral coenzyme Q10 supplementation equivalent to 60 mg a day reduced wrinkle area by 33 percent, wrinkle volume by 38 percent and mean wrinkle depth by 7 percent in just two weeks. The authors of the study note that these results are comparable to other studies completed on topical preparations. The results, however, are limited by the size of the study, which consisted of only eight female volunteers. 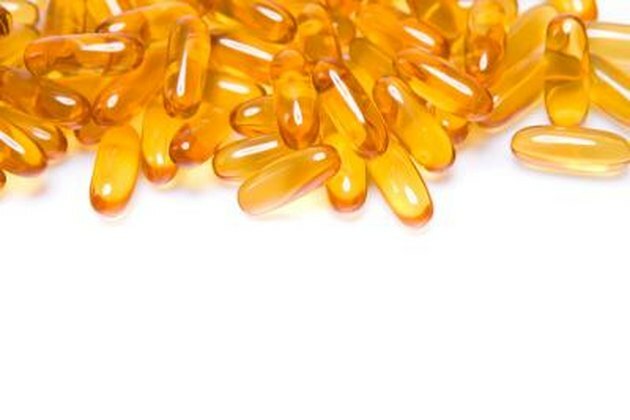 There is currently no recommended intake value established for coenzyme Q10; however, most studies involve dosages anywhere from 50 to 300 mg a day. In the previously mentioned study in "FOOD Style" magazine, participants in the study consumed 60 mg of coenzyme Q10 a day orally. The "Biofactors" study involved supplementation of 50 mg of coenzyme Q10 a day orally. Common side effects of oral coenzyme Q10 supplements include nausea, diarrhea, upset stomach, vomiting, decreased appetite, low blood pressure and skin rashes. Coenzyme Q10 should not be taken if you are pregnant, nursing or have low or high blood pressure. Coenzyme Q10 may interact with several medications including chemotherapy medications, warfarin and blood pressure medications.